"Professional & Timeless Photography Debbie & Larry were so professional, personable, and they both take beautiful photographs. I think often in the wedding photography industry you get a second shooter who may be newer or still learning the ropes, but Debbie & Larry are individually amazing & talented photographers with so much experience. They went above & beyond for our engagement session, and we now have the most breathtaking photos to display in our home. We also felt so comfortable photographing with them on our wedding day (and my husband hates being photographed!) They did a great job of coaching us while still looking natural and candid. I had researched a lot of photographers who had done weddings at our site, and they had hands down used the unique setting better than anyone else. 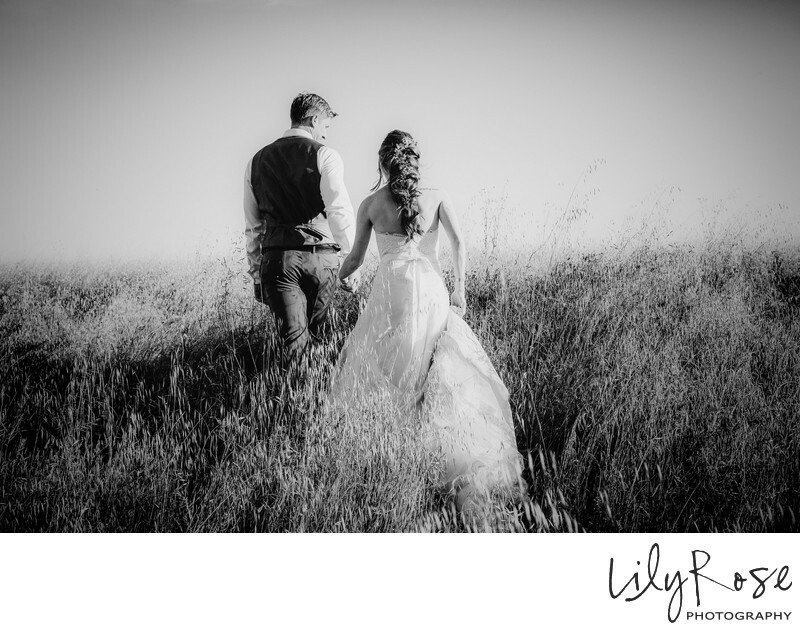 We highly recommend Lily Rose Photography to any bride & grooms to be! (Just look at the photos, they speak for themselves!)" "Debbie is SUCH an incredible photographer, she's truly an elevated breed of talent and professionalism. I don't even know how I can express how happy we were that she was a part of our big day. First off, she has such a great demeanor about her - although I typically get uncomfortable in photos, she made me feel completely relaxed on the day, and kept the photos natural and candid. I loved that our photos weren't posed or forced, and she knew all the right angles and direction to give us so that the pictures came out absolutely stunning. She's also got a great eye, and didn't miss a beat. Every moment that we had throughout the day was perfectly captured from every direction. Her artistic style really brought across the elegant and rustic vibe that we were looking for. On top of all of that, Debbie went above and beyond to make us feel truly special. She prioritized capturing every moment of our day, rather than asking us to pay more for extra hours. She not only came to do a shoot at our rehearsal, but also came to the bar where we had drinks afterwards to get a few more shots the day before the wedding. At the wedding itself, she gave us a small package with a sample of Polaroids of some of our best photos to send us off. She also sent us sneak peeks on Whatsapp immediately after she captured some great photos, and it took only a few weeks for her to deliver all the final photos on her website - most of my friends had to wait months to get their photos! Lastly, Debbie is so digitally savvy, everything that she does is so efficient, but still delivered at tip-top quality. I would hire Debbie for any big event we ever have again, she's hands down the best photographer we've ever worked with." "We had the pleasure of working with Debbie and Larry at our wedding in Napa. They were really incredible photographers - we could not have been happier with our photos. They did such a great job of getting a wide variety of shots, capturing all the details, and making creative suggestions. Plus, they managed to get the photos over to us very quickly! It can be really hard to take it all in on the day of your wedding and looking at the photos later really helped us relive and appreciate all the magical moments. Thank you so much Debbie and Larry." "Lily Rose Photography, simply the best!! Lily Rose Photography did our engagement and wedding day photos and we couldn't be happier. Debbie and Larry were awesome to work with, they quickly got a feel for who we were and what photos would work best for us and they captured our day perfectly. Not only did they take some amazing photos but they were both really fun to work with and they made this part of our wedding really easy and enjoyable. They completely exceeded our expectations and we definitely recommend working with them. Thank you so much Debbie and Larry!!!" "I cannot express enough what a great job Debbie and Larry did. I was blown away by their professionalism and well thought out process. From booking, engagement photo session, wedding day to the photo album. They exceeded our expectations, they took very beautiful and memorable pictures of our lives. Our photo album and parent albums turned out AMAZING! Our friends and family loved every single photos. You can’t tell that it was 100 degrees on our wedding day! I highly recommend Lily Rose Photography! " "Debbie and Larry are the PERFECT wedding photographers! From the first point of contact until the pictures and wedding album were delivered, they were absolutely amazing. Their attention to detail is impeccable. Debbie was so wonderful about answering my many questions. We communicated via email most of the time and she was always very quick to respond which completely set my mind at ease. Debbie is so incredibly organized so by the time our big day came, I had nothing to worry about. Debbie and Larry began our special day with capturing my “getting ready” session and they continued to capture our special day all the way through the ceremony and reception. Debbie and Larry captured shots that I didn’t even know I wanted! I was blown away by their taste, creativity, artistry, and professionalism. My husband and I chose to do a “first look” session before the ceremony and Debbie orchestrated the whole thing! She made sure my husband was in the right place at the right time so that amazing moment could be caught on camera. I will never forget a single moment from our wedding because Debbie and Larry captured every single part! And then to my biggest surprise during our reception, Debbie handed me roughly two dozen mini Polaroid pictures of moments they had captured throughout the day. You know how tough it is to go through your wedding day and know that your photographer is capturing amazing photos but you can’t see them?? Well, that’s not the case when you work with Debbie and Larry!!! Receiving those Polaroids during our reception was literally the icing on the cake of the most amazing day! I just cannot say enough great things about Debbie and Larry!! They created the most spectacular wedding album for us. I have never seen one like it before. Thank you a thousand times Debbie and Larry for ALL your hard work, care, concern, professionalism, kindness, organization, and creativity." "My partner and I love the beautiful photos of our wedding day and the album! The photos included such thoughtful touches that showcase each of our personalities. I also love the candid style of the photos, which made even posed shots genuine. I can't recommend Lily Rose Photography highly enough!!" 5 stars isn't nearly enough for Lily Rose Photography! Debbie and Larry are seriously artists and their photos look like they're straight out of a magazine. They just shot our wedding last weekend and we already saw remarkable pictures that they printed out for us on Polaroid film to take with of us on the night of the wedding. Talk about thoughtful and immediate gratification! We are so excited to see the rest, but from what we have seen so far we know they will be excellent. On top of being truly professional and an amazing team, they really think of everything. With our wedding package, they had a free engagement session to teach you how to pose with your significant other and we found this time super useful for the day of the wedding. On the day of the wedding they were a well-oiled machine, and flexible to adding spontaneous ideas to our planned shot list as we came up with them. One of the coolest things I've seen so far is what they were able to do with our cake. The cake we ordered had a symbol on the back and front and a cake topper that could only be read in one direction. However, the cake was put together backward by the bakery. Debbie somehow was able to take shots of both sides and put together a picture of the cake as it should have been! Wow, just wow! We are SO happy we choose Lily Rose for our special day and I cannot recommend them highly enough! They are absolutely worth every penny! Lily Rose Photography FAR exceeded our expectations. We chose them because the quality of their sample pictures for their price was much better than competitors, and the service and picture quality for our wedding was perfect. Debbie and her husband captured every photograph we wanted and had their own list of fantastic ideas. Their pictures captured the beauty of the vineyard and the day exactly how we wanted it. They were friendly, professional, and knowledgeable. I would recommend them to anyone - we're even hoping to fly them out to the east coast to photograph future family events! I have nothing but positive things to say about Debbie and her husband. They do phenomenal work and are a well-oiled machine together. My husband and I are very awkward when it comes to being in front of the camera and they worked with us right off the bat to get us as comfortable as we could be in front of the camera. From the engagement pictures to the wedding photos, everything was incredible. I highly recommend using Lily Rose Photography for your next event as I know they will not let you down. I would HIGHLY recommend Lily Rose Photography for any huge moment in your life (literally any excuse you can find... call them!). They shot my sisters wedding a year before mine in Napa and my wedding was in San Diego... and without even so much as a pause for thought, they came to be a part of my big day! As the bride, I spent most of my time with Debbie and let me just tell you - she is truly INCREDIBLE! She has an eye for detail and is just the sweetest human being I've ever met. Not only did she and her husband capture all of the special moments on my wedding day, but they then went out of their way to give me and my new husband another romantic photo-shoot the next day since we didn't have a whole lot of time for pictures together on our big day! Our wedding day was a blur of excitement, but our pictures speak one thousand words. I cannot thank Debbie and Larry enough and rest assured they will be my first call for any future photos! I highly recommend Debbie! My husband and I eloped in Napa and did all the planning from thousands of miles away. I did a TON of research on everything from venues to makeup artists. I'm SO happy I came across Lily Rose. I wanted amazing photos to show my friends and family who weren't there to witness the event, but I didn't want to break the bank either! Debbie was the perfect option for us. She was laid-back like we are, but she did an amazing job of wrangling the rowdy boys we had in our crew! Great sense of humor and INCREDIBLE photos. Can't recommend her enough! Trust me, I've done the research, and she is hands down the best option in the area and totally affordable! "I'm not even sure where to start with this review. Debbie and Lawrence have an absolutely breathtaking eye for creativity in their photos. I was hooked on their portfolio the second I saw it. I was also overjoyed when she sent me her package information and I found that she was well within my photography budget. It was just a no-brainer for me. I knew I had to book her as soon as I could and I am so glad that I did. Not that there was any doubt in my mind, but the memories and moments from my wedding day that her & her husband Lawrence captured are so elegant and beautiful that they honestly took my breath away when I saw them. I have received compliment after compliment on our photos. Make this the easiest decision you make in planning your wedding - hire Lily Rose Photography!! You will not regret it! THANK YOU x 1,000,000 Debbie & Lawrence! " We love Debbie! When I first reached out to her to meeting her in person, I knew she was the one to capture our special day. Capturing our engagement session to bring us outside of our comfort zone and see it create great portrait we love to our wedding day from start to finish. Debbie and her husband Larry are great to work with, they truly captured all the details of our special day. They are very professional, but down to earth, and so easy to work with. Trust in their craft and you will get gorgeous, priceless portraits to cherish a lifetime. Debbie and Larry are a dream team, they have a great vision, very professional, easy going and WONDERFUL to work with. When I spoke to Debbie over the phone to meeting her for the first time I know she was the one to capture my wedding day. We had a great experience from start to finish, we even had our engagement session, which really broke us out of our comfort zone and let us truly capture a different side to us in our photos. Which one main photo we used at our wedding to showcase and was not the normal posed photo, it's a photo everyone still talks about. Our experience with Debbie & Larry was truly complete with our wedding day, they truly captured it all and the photos are truly priceless. Debbie helped me stay calm and my husband keep it together especially before the ceremony. First look is a MUST, the emotions and every moment captured. Overall there is no other vendor to look into, trust me Lily Rose Photography is top notch! We could not have asked for better Photographers! Lily Rose is a husband and wife team. They are professional, extremely talented, and very organized. They made us feel very comfortable while working with them and they executed our vision perfectly! I would recommend them to anyone! Lily Rose was amazing; I couldn't have picked a better photographer!! Their clam attitude is just what everyone needs during a wedding. The photos came back quick and were better than we could have imagined. Thank for Lily Rose for treating us like family! I met Lily Rose Photography at an event where she was the photographer. Loved her immediately. She flowed through the crowd flawlessly capturing people’s smiles and genuine joy, without anyone realizing she was there. She was exactly what I was looking for. I hired her a month later without ever interviewing a wedding photographer. And I was not disappointed. She and her partner were outstanding. They were with us all day, guiding us and our guests at every single moment, with the highest level of professionalism and sincerity. I always felt beautiful and calm. Even our guests welcomed them and their cameras into their space, which resulted in the most wonderful photojournalism I’d ever seen. Later on, when my husband and I were looking through the gallery, he said tenderly, “I’ve never had anyone take such amazing photographs of me.” Lily Rose, thank you. You went above and beyond our expectations, and our hearts will be forever grateful. We are so grateful to Lily Rose Photography. Debbie was very flexible with us. My husband and I were on a small budget, and Debbie was able to adjust our limited time frame to include all of the important events for shooting. She and her husband were efficient, professional, and patient when things were running a little behind or not according to plan. They captured amazing moments and made everything look so romantic and magical and beautiful. She offered us many wonderful discounts and custom items, showing us that she cared about us, understood our financial situation, and really wanted our satisfaction. We are so happy Lily Rose Photography was part of our wedding! Debbie and her team were amazing-- Debbie was incredibly flexible with me, as the bride, in terms of helping me find the right packaging, the right look and feel, the photos I wanted to have. She even rescheduled our engagement photos twice because of less than ideal weather conditions. At the wedding itself, she and her team were true professionals, corralling the bridal party and extended family when needed so I wouldn't have to worry about a thing, politely keeping the amateur photographers among our families at bay, and checking in with me frequently to ensure they were capturing the elements I hoped for. The pictures turned out beautifully and I would recommend her to anyone. Debbie, the owner of Lily Rose, has been absolutely amazing to work with. Her professionalism and skill are unparalleled, and she is unique in that not only she knows the technical side of photography, having gone to school for it, she also has natural eye for aesthetics and what would make a beautiful photo. I would highly recommend! Debbie has both a fantastic eye for a great photo shot and the technical ability to capture it. She is very professional and punctual but still a blast to work with. We had only 45 minutes for our photo shoot at the wedding, and Debbie has the perfect personality to make the best of it - she is succinct, authoritative while courteous to get the families/bridal parties/us arranged in a timely fashion. She advised on how to position our bodies to look best for the camera. She came up with creative shots. She was proactive in photographing so many details of people/scenery/decor in down times. At the end of a beautiful event, we have amazing photos to preserve these memories and now can't imagine anyone else capturing it better. Debbie and Larry produce amazing work and are very talented. I am a very type A person and loved how organized and structured they were to help us get through the day, however some of my bridal party felt they were distant. They made sure to capture a variety of shots and didn't leave out any details. What you get is very well worth what you pay. Debbie also produced incredible engagement photos for us and was willing to travel! Thanks Lily Rose Photography!!! Deborah went out of her way to travel to our initial consultation. She brought samples of her work which were beautiful, and shared her love of photography with me along with a bit of her personal story. Her passion for what she does shows through in her work. She was very patient and responsive during the planning prior to the wedding giving advice providing good organizational tools. On our wedding day she brought a professional yet personable team. I've only seen a sneak peek of our pics but they look PHENOMENAL!!! I can't wait to see the rest and I know she truly captured all the beauty of our wonderful day. To top it all off she gives the rights to make your own prints. We would give Debbie and her team 10 stars if we could! It was wonderful to work with Debbie and her team. We felt really comfortable with her taking pictures of us. She has a really relaxing composure about her, but a slight fun side to her. She encouraged us to express ourselves and live in the moment by saying "Do it! Go for it!" It was our day and she made sure it was! When my husband and I looked at all the photos after our wedding, if felt as if we were watching a movie! Debbie is truly an amazing artist who captured so much life from our wedding event into her stunning photos. I have no idea how she captured all the little details and gave it the attention it deserved by either creatively preparing it to be photo ready or shooting it from an angle where it's sheer perfection! She also went above and beyond for us in listening to our needs and making sure it was executed in a unique way. She always kept her eyes and camera on us and still managed to get everything and everyone! We loved every single photo! It is clear that she is more than passionate about her work. She is truly talented in what she does and we are so grateful to have had her as our wedding photographer. We couldn't have imagined or wished for a better one. I could not have imagined what our wedding day would have been without Lily Rose photography! They captured every moment beautifully. They worked extremely hard in the 106 degree outside weather. My picky husband and I received hundreds of pictures we absolutely love-- hard to believe but true! The color, the poses, the fun, and the backgrounds captured are amazing! Debbie of Lilly Rose Photography was beyond a pleasure to work with. From the date of our very first meeting to Our Wedding day she was attentive, calm, reassuring and excited about the ideas we had for our pictures. Her professionalism and the quality of the pictures was more than I had even hoped for. After hearing many wedding Photography disaster stories from co-workers, friends and family members I was nervous that the same could happen to me but Debbie put my concerns at ease and assured me all will go well, and it did! I LOVE... LOVE... LOVE my pictures and always receive wonderful compliments. Lily Rose Photography is one of the very few vendors who will give you printing rights to ALL the shots taken, not just the few you can afford to purchase after paying a steep fee already. And believe me you will want all the Shots if Debbie and her crew have shot them! Lily Rose was amazing, I couldn't have picked a better photographer!! Their clam attitude is just what everyone needs during a wedding. The photos came back quick and were better than we could have imagined. Thank for Lily Rose for treating us like family! Debbie was very easy to work with and very very professional, asked for a lot of details and definitely was paying attention to every little thing. She and her husband also kept us on track on the day of the wedding. My husband and I had a fantastic experience with Lily Rose Photography! They were very professional and both Debbie and Larry made us feel very special throughout the entire process. They were quick to respond to our questions and needs. Also, they did everything that they can to make our wedding day the most special and memorable day. I would hire Debbie and Larry again in a heartbeat! Lily Rose is the absolute best. Debbie is very quick to respond and is the master of everything the day of the wedding. She did my brother's wedding prior to mine and I'm glad we chose her to do our wedding as well! Debbie, You have an amazing intuitive eye for photography to the point that I am have a challenge picking pictures to reproduce. Thank you for going above and beyond to make our photos exquisite. In addition, thank you and Larry for your drive and passion to make our wedding days memories last a lifetime. Where should I begin? Debbie is amazing to work with and I highly recommend her! She is by far the BEST vendor I used for my wedding by far. She exceeded my expectations in every way! She was nice, honest, easy going, willing to travel for not just the wedding but also the engagement shoot, reasonably priced for what you get, on time, timely in getting photos to me, made sure I had sneak peaks within a day or two and actually cared! I met her at a bridal show and scheduled a meeting with her, my mom, fiance and myself. It was an instant click and a no brainer. We got stuck in traffic and were almost 30 minutes late to our hour-long engagement shoot in Napa but Debbie was understanding and made it work. A day or two later, I had a sneak peek and then within 2 weeks the photos were online for us to build my engagement album which we choose to make into a guest book album. About two weeks later, we had our album already. The photos were amazing! At our wedding almost every guest made a comment on how beautiful and unique our guest book was. She did little things that made this experience special for us like sending us a note with a little surprise to help to prepare us for our big day and a call the week before the wedding where she was thinking of coming into town a day earlier (she past Sacramento and we are near San Francisco) and offered to photograph our rehearsal dinner if it was on that Friday and she was here. It was Thursday so that didn't work but then she said that if she came a day early and I needed help with wrapping my favors, she would help with that too! Not even my bridal party offered that! Day of the wedding, she brought Lindsey as our second shooter. Lindsey was with the guys for their getting ready photos and they are all still talking about how awesome Lindsey was. Both Lindsey and Debbie complimented each other so well and we all felt at ease and comfortable with them both! They took what must have been a million photos and it was almost like they weren't there most of the time. They did the formal photos and then stepped back and let the day happen. I am getting all of the photos later this week but the few they showed me at the wedding and the sneak preview I got a few days after are amazing! I even made one my yelp profile pic! I really cannot say enough good things about them! Both Debbie and Lindsey did an amazing job and surpassed all of my expectations! We have loved working with Larry and Debbie at Lily Rose Photography. They have delivered nothing but five star service. Value: Our package included an engagement photo session which provided the photos for our 11x13 guest book album as well as one day of photographer, a traditional 9x11 wedding album, and two matching parent albums. We ended up with over 1000 photos of our wedding and reception and over 100 engagement photos, all of which were incredible. It made finalizing the albums difficult. Service: While we worked with both Debbie and Larry before and after the wedding, Larry was our actual wedding photographer. Larry took the time to scout out of our venue the day before, as this was his first time shooting Mission Ranch. Day of, he showed up right on time and ready to go. He was busy taking pictures from the time he walked in until the moment he left but he never felt intrusive. There were several times when we forget he was even there. We returned from our honeymoon to find our album proof ready for our review. They took the time to walk us through each page and offered several suggestions to help us personalize the album and enhance each photo. If we had it to do all over again, we would absolutely use Lily Rose. Debbie Norman and Larry Labrot were amazing. They made the entire family feel at ease. We consider them family members after our daughters wedding. Before the wedding I had no idea what an impact the pictures would have after the event. It was clearly the best money spent on the wedding because it's what we have to remember one of our families most Amazing Events. Everyone who sees the pictures asks us for a business card, and wants to know who was in charge of photography. It's rare that I can say everyone looked great in the pictures, but Lily Rose really worked magic for us. Not only would I recommend them, I would highly advise anyone getting married to hire them quickly before they are booked. Great Photographer! Great Pictures! I would highly recommend! She was a wonderful photographer, she knew exactly what to look for and she was very good at catching quick moments. When doing all the family photographs, she didn't miss anyone, she made sure to get both sides. She was great to talk and hang out with too and she helped me a lot throughout the wedding with little things with my clothes and carrying things for me and calming me down in hectic situations. She was all around a great photographer. Debbie and Rob were absolutely amazing when they worked our wedding in Los Cabos, Mexico. At a time when everyone was stressed out, these two were abundantly cool and professional. (My wife and I were NOT thrilled with the options available locally in Cabo so we looked around and "interviewed" people we found that had the right eye and a photo-journalistic approach to wedding photography. It was by chance that Lily Rose was at a wedding convention in San Francisco we attended.) After choosing Lily Rose, we got a package that included an engagement photo session and this was where we really saw how focused Debbie is while on the job. She huffed along with our dog in tow and never complained - a minor miracle considering our dog's temperament... But this was the first sign of the good things to come. Months later in Mexico, Debbie and Rob showed up and made themselves available for whatever we needed. It's amazing how two people can become so embedded in the memory of such an important day - Debbie helping my wife relax between photos and Rob keeping me calm while I worked out both nerves and a SERIOUS hangover...and the photos. WOW, the photos... My wife and I were simply blown away when we saw how these two were able to capture the most amazing details as well as the bigger shots. I cannot begin to explain how badly I want to recommend Lily Rose Photography to anyone who is considering them for their wedding or other event. I'd love to pay forward the luck we had. My husband and I are very happy with our wedding pictures. We did our research and attended all the bridal shows and found that Lily Rose Photography offered the professional pictures that we wanted. On our wedding day, our photographers were there and ready--they were very patient, non-intrusive and they managed to capture all the details of our wedding day. We enjoyed everything about working with Debbie and her team. The pictures were fantastic, her work ethic and attention to detail was great and her patience and ability to work with everything on the day of the wedding made it easier for me to enjoy myself. Picking a photographer is much like picking a fiancé. You need to make sure you've got the right one because you're going to be with them for the rest of your life. We maybe not with *them,* the photographer, per se, but you will have their work forever--and you need to make sure that you're absolutely comfortable and trusting of what they're going to do with you. When we were first interviewing photographers, we experienced that fit Debbie Norman of Lily Rose Photographer. Not only was her work beautiful, but she had such a calm and soothing presence about her than made us trust her implicitly. As someone who hates taking photos, this was incredibly important to me. As part of her packages, she offers an engagement session where that perfect fit became even more apparent. She got to know us--how to best shoot us--and we got to know and be comfortable with her. Plus when we got the proofs we absolutely loved them. When the big day finally rolled around, we just slipped right into the mode. Debbie and her assistant Lindsey were right there capturing everything, but in a totally non-obtrusive way. They made sure to get the shot, but for the most part, I didn't even know they were there. Plus they managed some of the big group shots with absolute confidence and grace. While we haven't get gotten the photos, we know they're going to turn out great--and we know we have found our photographer to capture the rest of our important moments in our journey together. "Thoughts, quotes, and philosophies - good or bad - cause us to evaluate ourselves.